When building and maintaining your investment portfolio, diversity is important. One way to diversify is by investing in different asset classes. But one size does not fit all. The amount you allocate to each asset class will depend on your personal circumstance and investment goals. A share in the ownership of a public company. Typically provides moderate returns with varying product risk profiles. A debt instrument; an investor loans money to a corporation or government that borrows the funds for a fixed time period at a fixed interest rate. As a lower risk investment type, the returns tend to be lower. Physical or tangible assets that have value, due to their substance and properties. Real assets include precious metals, commodities, real estate, agricultural land, and oil. Cash, bank accounts, and equivalents, which include Treasury bills, bank certificates of deposit, bankers' acceptances, corporate commercial paper and other money market instruments. These securities are low-risk, with corresponding low returns. 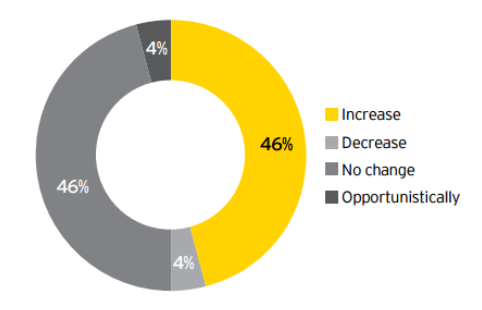 How are investors expected to change capital allocations to private equity by 2017? Why are the ultra-wealthy increasing their private equity holdings? Let’s examine the average returns of the various asset classes, including private equity. Notice in the table above that Private Growth Equity returns are higher than all of the other asset classes. Private equity firms require extremely high minimum investment sizes to gain entry, usually at least $1 million, but often, significantly higher. For example, most Canadian PE investments are between $15 to $50 million. Even if a retail investor had the million-dollar check required to invest, they wouldn’t know where to source PE deals.